I turned 50 last year and more than ever I am convinced that life is a journey into oneself. Although I have been working hard on healing myself and on a personal quest for inner peace for over ten years now, I am still learning, still doing the work. And so every year in January I peruse the Self Help shelves in order to see if I can find some new book which may assist me in my ‘work’ on myself. This year Dubray Bookshops have helpfully gathered some new self help books together in a section called ‘You Can Change Your Life’. This section is also on their website here. So just for you I have chosen a couple of new possibilities together with some of my old favourites to hopefully inspire you to continue on working to be the best version of you that you can be! I am delighted that my favourite of the new crop of self help books is an Irish publication, From Ordinary to Extraordinary (How To Live An Exceptional Life) by Brian Colbert and published by Gill & McMillan. What initially caught my eye about this book was in the blurb on the back which states “this book will teach you how to reprogramme your mind for success.” I firmly believe that our minds are the final frontier and are key to improving our lives in so many ways. I also liked the fact that Colbert draws on psychology, sociology, Shamanism, Taoism, Buddhism and NLP in this book because I don’t believe that any one discipline can provide us with all the answers, no more than one book can. Colbert talks about ‘mastering your mood’, ‘lightening up’ and says that ‘behaviour is what we do, and not who we are.’ He also has a section on ‘minding your language’. The text also contains plenty of simple short exercises aimed at helping you design your own plan for changing your life. All of which ring my bell and is why I think this book is well worth exploring further. In a similar vein is the book ‘You Can Change Your Life’ by Rob Yeung and published by Pan McMillan. On the first page of this book is the quote by Henry David Thoreau “things do not change – we change” and this is a theme that is explored by the author Rob Yeung. He makes the point that change will only occur if you really want to change. This is hugely important to anyone who does want to improve their life. You can buy every book in the shop, go to every workshop there is but the only person who can change your life is you! And you must want to change and do the work. Other themes explored include the power of visualisation and resilience (or how to keep going when things go wrong). All in all this is a similar type book to Brian Colberts and if you were torn between the two I would rate Colberts as better. Flagging Depression by Dr Harry Barry is published by Liberties Press and is not a new release but was a book that was recommended to me as being a goodie. Dr Barry is a GP from Louth with a particular interest in mental health and he has written a series of books on the subject. What I like about this (along with his great happy sounding name) is that it is written in a clear, simple, non jargon style. The book begins with a very clear explanation of what depression is… something which will help not only those who suffer from the condition but those of us who may have a friend or family member who is afflicted. 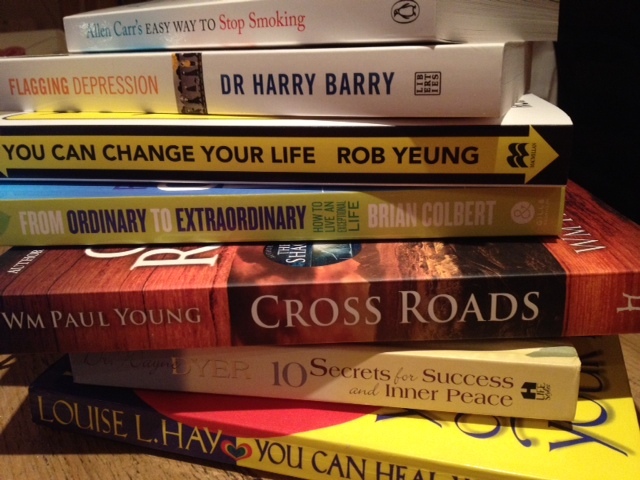 The majority of the book is devoted to outlining how to begin and continue a journey to wellness and Dr Barry draws on various techniques including lifestyle changes, talking therapy, drug therapy and alternative therapies including CBT. It is this holistic approach and the clear easy to read style that particularly appeals to me about this book. Another book that was suggested to me for my self help list was Allen Carr’s Easy Way to Stop Smoking which is published by Penguin. A certain radio producer credits this book with her success in giving up smoking ten months ago. I was a smoker, a 20-a-day girl until about 16 years ago when I finally gave up by going cold turkey and it was not easy. But Allen Carr says if you read his book you will find giving up is fierce easy. His book is the world’s bestselling book on giving up smoking, endorsed on Amazon.com by Anjelica Huston, Anthony Hopkins and Aston Kutcher no less. Carr was a bit of an expert on smoking and trying to give up. He apparently smoked 100 cigarettes a day…. is that actually possible? The fact that he himself, having given up, did die of lung cancer in 2006 should add urgency to your attempts to kick this horrible habit. Perhaps I would have found it much easier if I had had this book back in 1996 when I was a grumpy, wheezy, cream cake guzzling struggling ex smoker. I will never know… but if you are struggling with the fags I think you could do worse that gamble the cost of 40 of those fags on this book. Right now for some of my old favourites…..
First up is The Shack by Wm Paul Young. This is a book I was fairly sure I would not read because the story begins with the abduction of the main character’s young daughter who is then murdered in a shack. I hate reading such horror….. but in the case of this book there needed to be something very shocking in order to really understand the rest of the story. And that is what this book is – a story – a novel. But the story is a metaphor for how we get hurt in life and then stuck. It is difficult to explain the story but suffice to say that this book changed entirely how I thought about God. It also went a long way in helping me to discard much of what I had been taught about God by my Catholic upbringing – the God who is a paternal judging God and it ‘out there’ somewhere very separate from us. In the Shack the main character meets a very different God – who is portrayed as an African scone baking mama, along with Jesus and Soraya (the Holy Spirit). All I can say is that I loved this book. Deeply. If you have a spiritual bent, if you would like to explore a new way of thinking about God, give this book a try. I can’t wait to get stuck in. You Can Heal Your Life by Louise Hay was one of the first self help books I read when I begin my own self healing journey and it helped me greatly and I have no hesitation in recommending it. It is one of the classics of the genre and its author has gone on to run a publishing and self help empire. Like the first book I mention in this post, the basic premise of You Can Heal Your Life is that our thoughts and beliefs can cause us an awful lot of hassle in every aspect of our lives. Hay states that “just because you believe it doesn’t make it true”. She also says that “awareness if the first step to healing and change.” She talks about how to change and the importance of releasing the past and forgiveness. All of which I fully endorse. You won’t agree with everything in this book, but in my opinion there are enough nuggets of wisdom and challenging theories to make this a book I will never part with. Finally, a book I revisit over and over again because I love its simplicity and the fact that it makes me feel happy and optimistic is 10 Secrets for Success and Inner Peace by Dr Wayne Dyer. Again this is a spiritual book in which Dyer gives us 10 secrets for a better life. From the First Secret which is Have a mind that is open to everything and attached to nothing to the tenth which is Avoid all thoughts that weaken you this is a beautiful book to dip into over and over again. These are merely my suggestions. But as one of my Reiki teachers used to advise me when looking for self help book recommendations “just go into the book shop and browse, the book you need will come to your attention… you will know it when you see it”. And you will. Enjoy some life changing reading and Happy New Year! I was noting the other day that I've had some Dubray vouchers for some time which I must put to good use. Your research and recommendations here are very timely. Which of us can't use a bit of self-help and self-improvement! PS – I thought The Shack was wonderful too! Barbara, I am delighted to see Louise Hay's book mentioned here. I tend to veer on the melancholy side at times and self help books have been of great assistance to jolt me back to reality again. You can heal your life is one of the first ones I ever read. I also love Dr Wayne Dyer. My favourite one is 'pulling your own strings' how not to be a victim of other people, life in general and yourself! I am heading towards fifty myself now and started this journey about twelve years ago. I am a work in progress but its so nice to have an awareness that I didn't have in my younger days. If I knew then what I know now….